The language file editor includes several functions for checking the formal quality of the translation. Each time a text element is accessed or changed, the quality check function is executed. The result is immediately shown in the message box with the orange background which is placed in the upper right part of the dialog box. · If the text element of the language file loaded is empty, the message "No text" is displayed. · If the text element of the language file loaded does not contain the same variables as the reference/source text, the message "Check these Variables" is displayed, and the problematic variables are listed. If you check this checkbox, a message is displayed if the text element of the language file edited contains fewer words than the lower limit or more words than the upper limit compared to the reference/source text. 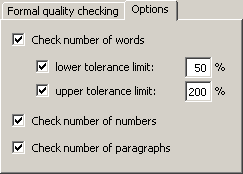 The limits can be defined in the two text boxes: lower tolerance limit and upper tolerance limit. If you check this checkbox, a message is displayed if the number of numbers is different. If you check this checkbox, a message is displayed if the number of paragraph tags is different. If the active text element is correct, from a formal point of view, "OK" is displayed.